Samford University education professor Amanda Strong Hilsmier well remembers the low-income school where she began her teaching career in special education. "All my students were poor readers, which impacted their opportunities in the general education classroom. I also noticed that as my students who were poor readers got older, their behavior became a bigger and bigger issue," said Dr. Hilsmier, now an associate professor in Samford's Orlean Bullard Beeson School of Education and Professional Studies. That early career experience influenced Hilsmier's doctoral research in emotional behavioral disorders at Vanderbilt University, where she investigated ways to improve reading skills and motivation in students with identified behavior concerns. 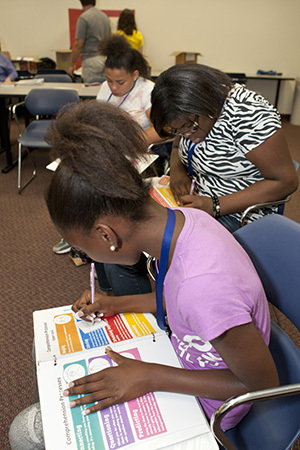 Fast forward to the summer of 2012, when Hilsmier, working in partnership with Samford, the Jefferson County Board of Education and the Alabama Department of Mental Health, led an intensive summer reading program for at-risk middle school students. For six weeks, 18 students from Birmingham area schools spent four mornings a week in small group reading instruction on the Samford campus. Students worked in groups of three with a trained tutor from Samford's education school, and a certified reading teacher from Jefferson County schools. The participants received help in reading fluency, vocabulary and comprehension. The middle school students were chosen for the program based on pre-testing that showed a reading deficiency as well as a history of behavioral and other academic concerns, explains Hilsmier. Educators know that once in high school, many students with reading failure drop out. Students with behavioral problems are more like to be unemployed, exhibit poor work history and have greater social adjustment problems. "The upper elementary and middle school years are often the last chance to intervene with a struggling reader prior to the legal school dropout age," said Hilsmier, who with the other program partners spent more than a year planning the 2012 Pathway to Graduation summer project. The time was well spent, as the educators carefully crafted ways to maximize the participants' time. "Many of the participants received individual attention from the Samford volunteers that is not possible during the school year," said Hilsmier. "A huge piece that is unique to our project is the daily counseling component that was meant to help address behavior issues noted in the participants, who worked through a curriculum that helped them develop coping skills and motivation to be successful in school." Guest speakers from the community met weekly with the students to motivate and provide real world advice on setting goals for their future. Speakers and topics included Restoration Academy administrator Ty Williams on choosing good character decisions even when facing hardship, Football and God author Chad Gibbs on setting realistic goals, and electrical engineer and instructor Bill Roberson on trade work education and job opportunities. The daily schedule included an exercise break and lunch. The program got its start several years ago at Samford's Children's Learning Center, where Hilsmier went daily to pick up her pre-school age child. Another parent on pickup duty was Becky Milstead, a 1994 Samford graduate and licensed professional counselor with the Jefferson, Blount and St. Clair Mental Health Department. "She had been working with a middle school boy who was a non-reader, and was amazed at his progress over six weeks using an explicit reading program," remembers Hilsmier, referring to a type of instruction that focuses on reading skills. As the desire to offer a similar type of instruction to a larger group of students evolved, the collaborators applied for various grants. Support came in the form of a $25,000 grant from the Community Foundation of Greater Birmingham and other monies from a Samford Faculty Development grant. The latter funds were used primarily to purchase instructional materials and pre/post testing systems. School of Education dean Dr. Jean Ann Box and teacher education chair Dr. Betsy Rogers also provided funding. A collaborative spirit among the partnering sponsors prevailed throughout the process. In addition to the Samford-based educators, Jefferson County special education administrators Susan Wirt, Diane McTamney and Mary Beth Malone functioned in many resource, funding and hands-on roles during planning and implementation. Milstead obtained the counselors that met with the participants each day. The project proved beneficial for the Samford tutors, all of whom were undergraduate or graduate teacher education students. "They said it was a great experience for their special education clinical coursework, and that they got a lot more hands on experience than their peers who were unable to participate," said Hilsmier. "Several expressed an interest in teaching special education after this project." Hilsmier is using her 2013 spring term sabbatical to review the summer project's data. She plans to write an article for the Journal of Adolescent and Adult Literacy or a similar publication on summer reading programs and a school/university partnership.